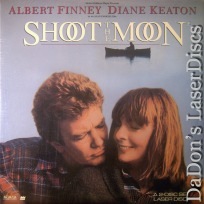 Shoot the Moon 1982 - 124 min. 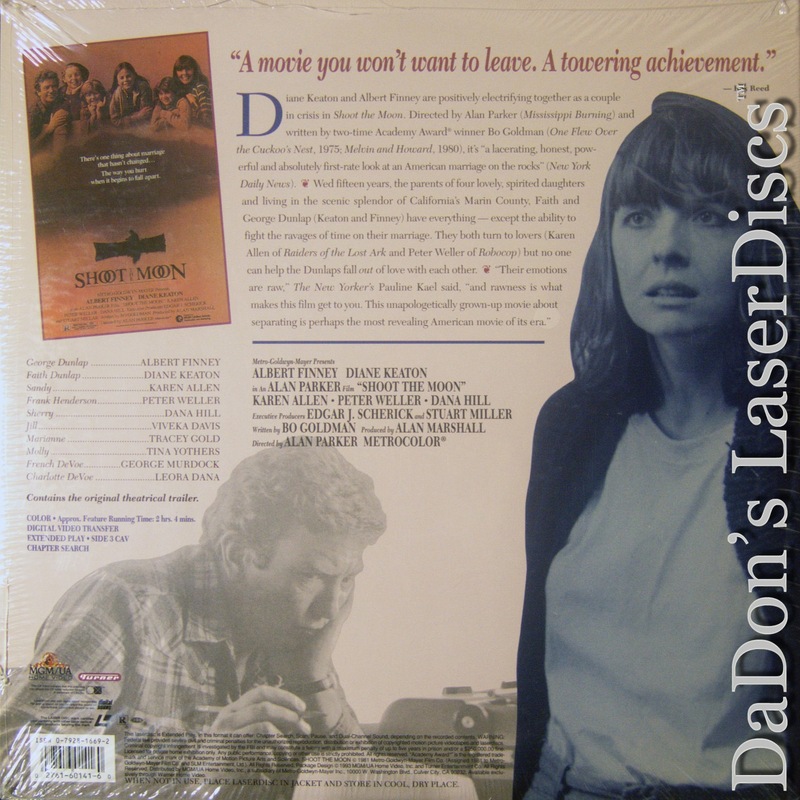 - Color Genre: Drama Rated R Country: USA LaserDisc Movie Review: Director Alan Parker and writer Bo Goldman chronicle the emotional disintegration of an unhappy marriage. Albert Finney and Diane Keaton play George and Faith Dunlap, a seemingly happily married couple living with their four daughters in a converted farmhouse in Marin County, California. George is inwardly empty and decides to have an affair with Sandy (Karen Allen), who has doubts about how long their affair will last. Faith is also suffering from ennui and takes up with Frank Henderson (Peter Weller), the contractor for the Dunlap's tennis court. Frank, after discovering about Faith's affair, is in a confused state: he wants to leave and live with Sandy but doesn't want his wife to date other men and demands the love of his daughters --- all of whom now detest him. --- Paul Brenner Alan Parker's film about the downside of the Marin County lifestyle of the period that Cyra McFadden had satirized in Serial tracks the course of a disintegrating marriage. While the subject is the stuff of a thousand TV movies, and it can't be said that the film finds much new to say, Keaton and Finney raise the tone well above the usual fare, and Academy Award-winning screenwriter Bo Goldman is a careful observer of the difficult details of divorce. The film is somewhat skewed in the direction of Finney's father and husband, and the actor plays this loving, blundering, self-pitying character with an undertone of imminent anarchy that gives the film its edge. Keaton is equally good in a less meaty part, but one feels the absence of any compelling attempt to identify what went wrong, though few films are willing to put an audience through the kind of pain Ingmar Bergman put onscreen in the classic Scenes From a Marriage (1973). Casting Peter Weller as Keaton's boyfriend seems a little gimmicky, his don't-mess-with-me persona adding extra conflict to an already fraught situation. But Finney's tennis court conflagration with him is a sadly fascinating scene, a metaphor for the territoriality of marriage, and the explosion of a West Coast Lear who has finally grasped the implications of his actions. --- Michael Costello Thanks for Visiting DaDon's Rare LaserDiscs ! Reviews, Articles, Newsletter and Information for Movies on LaserDisc LD Laser Disc, LazerDisc.